Today's recipe is from Sandy Coughlin at Reluctant Entertainer. Sandy is one of those dear people I feel as though I know--almost as if she were a neighbor of mine--yet I've never yet actually had the pleasure to meet her in real life! Sandy's blog is a treasure trove of recipes and good advice for how to extend hospitality, such as her 10 Commandments of Hospitality. Sandy has also written a book called Reluctant Entertainer. 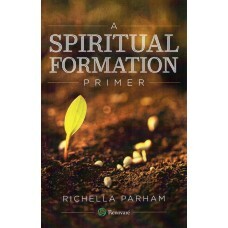 I own a copy and have given two away as gifts--it's a wonderful book! I'm glad to be here at Imparting Grace today to share my recipe for Coconut Milk Chicken Thighs. This recipe is great for every day--really easy and yummy! I've re-discovered chicken thighs. I've learned that they are higher in fat and calories than chicken breasts, but as long as you remove the skin and any excess fat, economical thighs fit into a good-for-you diet. They also provide 25 percent more iron and and more than twice as much zinc as the same amount of breast meat. 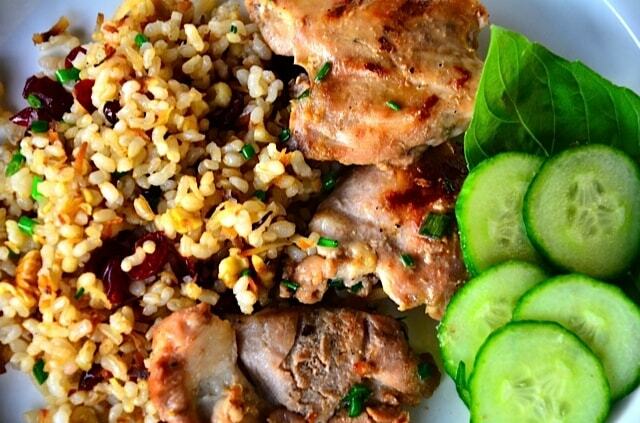 You'll love this easy recipe using chicken thighs! Mix all ingredients together. Leave some chives out for garnishing chicken after it's grilled. Marinate in refrigerator for 12-24 hours. When ready to serve, remove chicken from marinade. Grill until cooked through. Sprinkle with fresh chives and serve. Thank you so much for this recipe, Sandy! Sandy originally published this recipe at Reluctant Entertainer. If you'd like to pin it, you should click here and pin Sandy's post (plus she includes even more wonderful photos and a printable recipe--you'll be glad you clicked over there!). Dear Lord, we are so grateful to be at this table to partake of the bounty that you've provided. Help us to remember, Lord, that every good gift comes from you. We thank You for providing all that we need. We ask you now to bless this food as we eat it and bless our bodies as they gain strength from this food. May we always use our bodies to serve and honor You. Amen. (Although I'm vegetarian) that meals looks very good. I cook with coconut milk at least once or twice a week! :) Soooo yum! I'll probably be making a Jamaican rice tomorrow for my Vegan Tuesday, it uses coconut milk as a base. 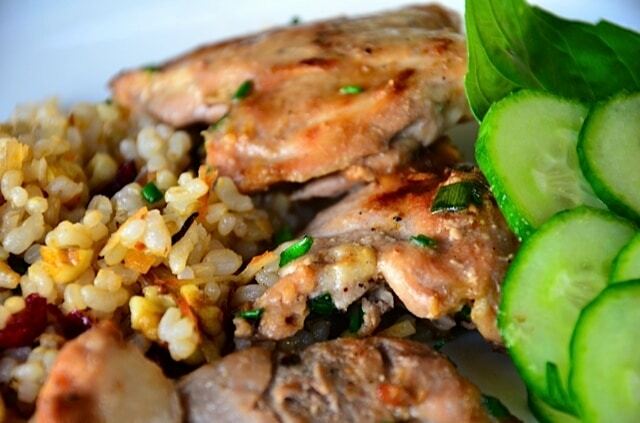 Hi Richella, Thank you for sharing this recipe; hubby prefers thighs to any other part of the chicken and being gluten free I appreciate the simple ingredients. I will check out your friends blog-looks really good; I can't wait to make this dish. Sandy really is wonderful! I would never have thought of using coconut milk, but I know this must be yummy! Stephanie, I would love to see your recipe for Jamaican rice! Mmmm that sounds luuurvley...think we'll be having that for tea tonight...my husband will be pleased!